Enjoy Year Round Family Fun! Welcome to Moose Hollow 503! Whether you love the warm Utah sun or the champagne powder snow, a vacation at MH503 will be your perfect getaway. With endless recreation including two world class ski resorts, two pristine lakes for boating, wakeboarding, and kayaking, cross country skiing, hiking and mountain biking. Main Level: Kitchen, living room with TV, and fireplace, full bathroom, balcony, and bedroom. Downstairs: One master suite bedroom with walk-out patio, standard bedroom, hallway bathroom, and laundry room. Bedroom 1: 1 King bed master with futon sofa sleeper and ensuite bathroom. Bedroom 2: 2 Full beds with shared full hallway bathroom. Bedroom 3: 1 Twin bed over a full bunk bed. 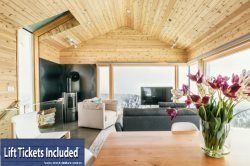 We are truly excited and honored to share our homes with each and every guest and we invite you to stay with us at Powder Mountain Getaways - MH503!